One of the most important investments a bride can make in her wedding is capturing those moments, both on photos AND video. Each brings to the table something special and unique. There’s something magical about one special moment frozen in time in a high quality photograph. Likewise, there’s nothing more powerful at taking you back to that special day than hearing and seeing your vows again, or those toasts by loved ones. Unfortunately, for years wedding video has had a bad stigma attached. Even today, given all the advances in wedding filmmaking, and given the amazing work done by colleagues like StillMotion, Kevin Shahinian, David Robin, Kristen* of Bliss Productions, Loyd Calomay, and many, many more artists, I’m shocked when I hear a friend or acquaintance tell me they’re NOT getting a professional wedding video. Brides often feel like they have to choose between photos and video, when BOTH are equally important. Most companies in the wedding industry are starting to get it. But now it would seem it’s time to start educating vendors that sell to professional image makers. 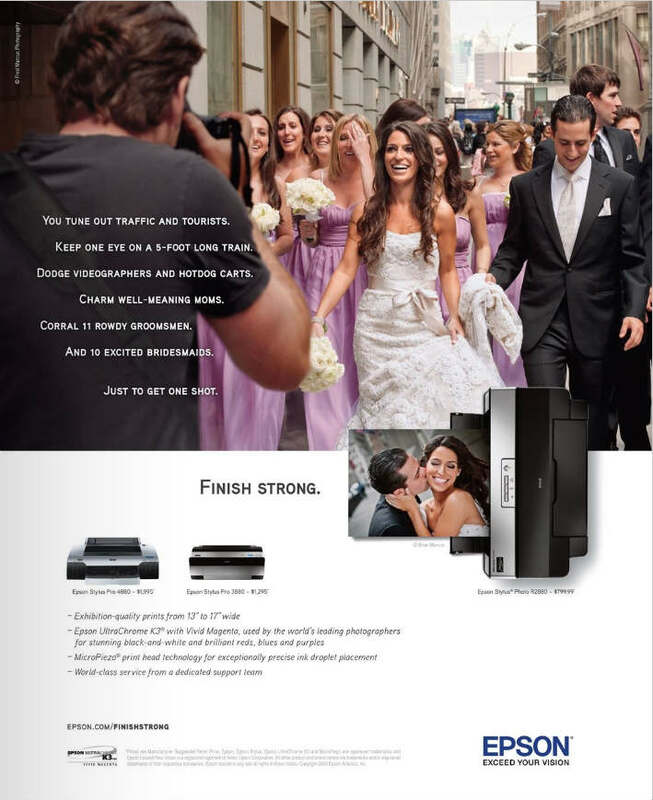 I was quite shocked and disappointed to see this full page Epson ad in a popular magazine geared towards pro photographers. I’m passionate about this because I started in this business as a wedding filmmaker (and still do some high end referral work via Dawson Signature Films). And even though it’s no longer my primary bread and butter, I still care a great deal for the industry. Did NO one in the Epson marketing department think such an ad would insult an industry? Am I just over-reacting to an ad like this? What do you think? WOW! I completely agree with you Ron, its insulting to our industry and giving the false impression of how bothersome a wedding filmmaker is. While there are many out there who create amazing work and continue to push our industry forward, there will always be giant corporations that continue to throw mud shape the minds of their target audience. If I’m going to be honest, its part right on on your part and then one part over reaction. I didn’t read it as a diss, but then again, Im not as entrenched in the video/film segment of creativity as you are. I didn’t see it as a diss as much as a ad agency copy-writing tongue in cheek or no intent if at all. However, I do stand by you in pointing in out. Not for pc sake, but for common sense sake. Thanks for commenting Chase. The point you make about not being entrenched is key. Every wedding photog who sees this ad will react to it the way I assume the makers of the ad intended: a comic jab at wedding videographers. It’s a huge bugaboo for many photographers AND videographers each other getting in the way of the other. The makers of the ad had to know that, why else mention the videographer and not “Uncle Bob.” Truth is, friends and relatives get in the way much more than a pro videographer. I’d be curious to hear what other wedding photogs think. Ron, since you made the comment “Every wedding photog who sees this ad will react to it the way I assume the makers of the ad intended: a comic jab at wedding videographers.” I thought I, as a wedding photog, should comment. I didn’t read it this way at all. I didn’t think of it as a comic jab, or a diss or even a bad thing. I saw it as an example of how much is going on at a wedding and that even when its crazy busy you’ve got to get the shot. There are times when Travis and I are working the same wedding (photo and video) and I have to dodge around him to GET OUT OF HIS SHOT! I’m dodging him because I want him to get that shot! JMO, but I didn’t read it as a diss at all. I think the issue isn’t whether or not it happens. I know it does. But, there are a lot of real problems that arise between photogs and videogs working together because of this perception. If the videog is seen as an “obstacle” or eye-sore, he/she will get less respect from the photog. An overwhelming majority of the photogs I’ve had the pleasure to work with are consummate professionals. We communicate well, share time, and “play nice.” But, I have had my fair share of run-ins with photogs who looked on me like I was a dog, and/or didn’t do anything to ensure I got equal time with my client. And for the record, I don’t think Epson meant any harm, I just don’t think they were thinking it through. A LOT of videogs use Epson printers for DVD printing. Why piss them off? This is exactly what I was thinking. I’m always hearing complaints that “people” forget about wedding videographers, then when they remember….it’s a diss? Thanks for the mention Ron. I just had an in-depth discussion with a well established photographer. Unfortunately with the influx of so many new filmmakers all touting sliders, stedicams and jibs, he feels the new generation are lacking in the “consideration” department. Yes, just because the filmmaker is there creating his “film”, he still needs to be considerate of his surroundings and the other vendors involved. Also, this photographer feels some of the over zealous filmmakers are ruining the ambience and aesthetic, with huge crews and 20ft jibs. Food for thought for young filmmakers! On the other hand I hope Epson gets crushed by its competitors, and rots in hell! Hmmm. That is very insightful David. Great point. Even I have commented on our boards that I’m surprised at the gear some people use at weddings (e.g. jibs, full blown steadicams, etc.) Definitely good food for thought. Thanks Mr. Robin. I agree with you Ron, this does nothing but send out a negative vibe about the photo & video industry because it belittles the importance of wedding video production while at the same time showing that wedding photographers have no respect for the importance of the event by turning up to work in a t-shirt. DR & RD, I totally agree with you guys, new wedding film-makers have a major gear fetish ultimately turning the wedding day into a movie set with their crews & equipment. We’re shooting weddings people, not making the next Academy award entry, have some respect for the bride & groom, their family & friends. Just kidding of course, but in all seriousness, if this photographer were any good he wouldn’t be printing out his photos via an Epson inkjet anyway…. i know this is a straw-man argument, but i’ve never owned a decent Epson printer. Take, THAT, Epson! it’s a sad truth, most of the videographers we come across at weddings are goobers… they aren’t very good, they’re in the way, they’re rude and yeah, we’re working to keep them out of frame. yes, I’ve worked with some AMAZING videographers, but the majority of the time, it’s not a great experience, and I think epson nailed it. in the end, Epson made an ad that we’re all now discussing… wish I could make and ad that got my clients to have a huge discussion. I would have to agree that a lot of videographers can be “in the way”… unfortunately, I have that same experience with photographers. There are just as many photographers out there that think they own the shoot as their are videographers. Is there a lack of education on etiquette? Heck ya there is! Is there a lack of communication? You bet! The problem is we are on the same team, but we just don’t realize it. As visual artists and vendors we have to work together and should never condemn, criticize or complain against one another. I have found the best way to prevent this “stigma” is a phone call. I know it sounds crazy and maybe even impossible 🙂 A phone call a week before the wedding to the other visual artist. Let the other person talk about themselves for a while, then share what you would both hope to shoot at the wedding… share your shooting style… maybe some past experiences that both of you can relate to (positive ones). If we do this, no longer will we be battling each other. We will work as a team on the day of the shoot and not rivals. Challenge yourself to a different approach to getting certain shots. I think Epson nailed promoting negativity rather than evoke change in ones thought process to etiquette and their product. There are a lot of photo/video hybrid studios out there too. By insulting industries (or people) it will only breed more defensiveness and fuel the fire… by commending and praising people it will make them instantly like you and they will want to hear what you have to say. Bad marketing idea Epson. The first time I read the add I actually missed the line that said “Dodge videographers…” and wondered what the heck ol’ Ron was talking about! Haha. Thanks for sharing Ron. What a shame that corporate America would continue to perpetuate an image we’re working so hard to change. Hey Ron, I don’t think you’re over reacting to this. It was a pretty ignorant thing for Epson marketing to do. The wedding industry has grown drastically in the past decades, photography and video alike. Yes there are still some in both genres that still like to re enact the first kiss, and have the bride re exit the limo if they missed the shot. But there’s the new generation of videographers, and photographers that would love nothing more than to capture their client stopping to eat from that hot dog stand, or capture each other in the shot/clip because that’s what happened. It’s time for Epson to move forward in their view and thinking of the other industry that doesn’t use their “AWESOME” printers (in case Epson is reading this). If they want they can give me a few of those “AWESOME” printers and I’ll create a new add for them. OMG, it’s worst than I thought!!!!!!! 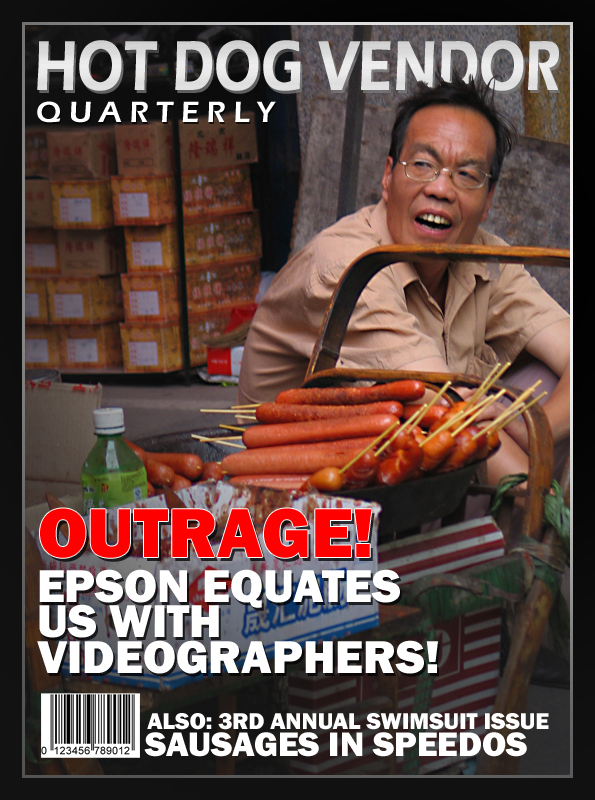 Epson should be looking over their shoulder, those Hot Dog guys are crazy!!!! As an optimist, being compared to a hotdog cart is better than a dumptruck, right? And the first thing I thought of too is how cute a hotdog cart might look in a photo on a street. However, I think the point is that all three move and sometimes, yes sometimes, us videographers (filmmakers) do need to be dodged for the sake of a moment! I only say this because I’m often dodging photographers all day long at a wedding event too. Although I’d prefer to think of it as a dance, rather than a dodge… some photographers just dance better with filmmakers and vice versa. It’s give and take and when the chemistry is right, it’s a beautiful rewarding day for everyone! On another hand, I wonder if the word “filmmaker” would have the same effect on the ad? Not likely. My wife (Candice) has a point that not all photographers are going to see this as a dis to videographers. That said, I do think that Epson unknowingly reinforced a stereotype in this ad. It’s okay to be frustrated by this, but we need to keep things in perspective. Epson certainly didn’t set out to belittle what we do with this ad. As frustrating as this ad is for videographers, it’s also an indication of how we are still perceived and how far we still have to go to push our industry forward and gain more respect. I think it’s healthy to debate/discuss an ad like this, but I think there’s a line where it becomes unhealthy. True success never comes to those who sulk in frustration. If we really want our industry to get the respect it deserves, we just have to keep pushing it forward so that others recognize that it deserves that respect. I think we’re already on that road and this is just a minor speedbump on the way. So vent away, but don’t lose sight of how far we’ve come and where we’re headed.